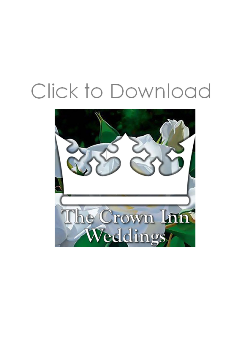 The Crown Inn Restaurant is an idyllic setting as a wedding reception venue within easy travelling distance of Huntingdon, St Ives, Warboys and Ramsey in historic Cambridgeshire. Located directly opposite the stunning 14th Broughton century All Saints Church, or a short drive from Huntingdon registry office the Crown Inn makes the perfect wedding reception venue. Our experienced wedding and event co-ordinators will be delighted to arrange your special day so that it is exactly tailored to both personal requirements and budget. We are able to provide a complete service including marquees, catering, flowers, entertainment, bars as well providing professional and dedicated staff. Packages can be created to suit you - every event should be as individual as the people that it is for.